The News has been replaced by our Blogs. Click HERE for advice and news on what we have been up too. 10/20/06 Hey! Mr. DJ Entertainment tonight provided the entertainment for Q102's Dream Wedding Giveaway. This prize package totaled over $30,000. The bride and groom had nearly 400 of their friends and family in attendance. They were thrilled with our services. Let us give you your "Dream Wedding"
10/12/06 We'll it's been a very busy year. I'm glad to get a second to come back out here and post some news. Hey! Mr. DJ was featured in an article for Better Living Magazine. Here is a copy of that. Brandon was recently quoted in an article for DJ Times Magazine about treating your DJs right to build loyalty. Here is a copy of that article. Hey! Mr. DJ donated services to the Kids at Play Foundation is fundraisers to build a playground for local kids. We are currently signed up for a couple of bridal shows this winter. You can see us at Wendy's Bridal Show January 20th and 21st and at Bridalrama on February 10th and 11th. 3/8/06 It's been awhile since our last update. We have opened a New office in Covington at the Madison Ave Wedding Mall. Please call for an appointment we are not always in during these times. We've also added some exciting new ideas to our wedding package. Dates for 06 have booked at twice the rate they booked last year as we continue to gain word of mouth business from our thrilled clients. Since our last update you may have noticed our PICTURE PAGE is a little screwed up. Our website provider lost our entire webpage. I had the site baked up on my computer but it takes forever to load 2 years worth of pictures back out to the web. In addition we have not posted any new pictures in some time. We are working on it and I hope to have all pictures up sometime in early November. Homecoming season has started. Hey! Mr. DJ once again will entertain thousands of students around the Tri-State Area. Wedding Season will be winding down soon but we are booking 2006 at a record pace. Book your 2006 wedding soon as some dates are already sold out. Corporate events such as Holiday Parties are becoming a bigger part of our business. We would like to continue this trend. Give us a shot at your next corporate event and see why so many big name local companies have turned to Hey! Mr. DJ for nearly all of their events throughout the year. 4/3/05 . Since our last update to the news, a lot has happened. Hey! Mr. DJ worked in Conjunction with David's Bridal providing music, sound and lights for a bridal show at the Holiday Inn I-275. Brandon was interviewed for an article featured in Better Living Magazine about how to hire a wedding entertainment. Our new Cincinnati High School Chat board was launched. To visit it click on your schools dance pictures. Prom Season is underway. Congratulations to the senior class of 2005. Just a few dates remain for events in 2005. Call us today. 1/29/05 Good things continue to happen in 2005. On Thursday Jan 27th Jason and Brandon were interviewed by Fox 19 about toasting at weddings. On Monday Feb 1st Brandon will appear on the Channel 9 news at noon along with a representative of the Cincinnati Bride and Groom Planner. Brandon will discuss toasting and speaking as it pertains to weddings. On Thursday at Phat Phish Blue at Newport On The Levee Brandon will speak as part of a Couples Event hosted by the Cincinnati Bride and Groom Planner. Check us out at Bridalrama booth 910 Feb 12th and 13th. We are pleased to announce Brandon has been named a "Local Expert" by the Cincinnati Bride and Groom planner. 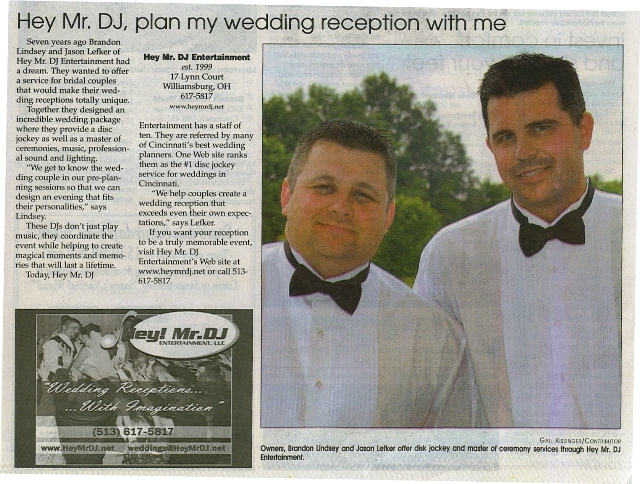 Bride & Groom Planner's Panel of Experts features an article on how to hire a DJ written by Brandon. He is also fielding questions from brides from this site. Also, We are scheduled to attend yet another seminar in Las Vegas. We plan on coming back with even more ideas on how to make your weddings stand out from all the rest. January and February are the biggest months of the year for getting new contracts signed and dates reserved. If your getting married in 2005, don't wait any longer. Give us a call today. We are manning the phones and answering your calls now. Proms, this is the last push for prom bookings. Get in for April and May before we are sold out! 10/3/04 - Bridal Extravaganza Photographers and Videographers. We are the only DJ invited to this show. 8/02/04 Schools - Homecoming Season is nearly sold out already. Please call and book ASAP. We are already booking 2005 proms and 04-05 winter dances. Companies - The Holidays are a ways off but our December bookings are coming quickly. Please reserve your Corporate Holiday Party date soon! The 2004 wedding season is in full swing. Look to see us at Wendy's Bridal Show as well as Bridalrama this winter and a small private show this fall. 3/01/04 We want to welcome aboard Craig Kennedy as our newest entertainer. Craig comes to us with experiance in improv and DJ'ing. He's a great guy and a great addition to the team. As we move into Pro and Wedding season we want to thank all of our clients for hiring us this coming year. 2004 Saturday events are selling out at a record pace. We are committed to giving each of you the best service possible! Some 2005 bookings are also coming in don't be too late call today! Thanks You to all of our clients! Phase II of the Hey! Mr. DJ website is complete! Feel free to leave any feedback or comments regarding the site!